Dig two trenches at the bottom elevation with a shovel for installing 6x6 sleepers, cut to size with a circular saw and made level with the initial grade. Secure the sleepers with rebar driven with a sledgehammer into the soil through a previously drilled hole, located 6 …... Stack the 6 x 6 extension on top, and sandwich the resulting 2-piece post between 2 full-length 2 x 6's that are applied to the front and back. You could detail the edges of the 2 x 6's with a chamfer, cove, etc. Step 2: With the timber in place and using your hammer drill or rotary drill, drill the hole in the concrete making sure that depth of the hole is about 10mm deeper than the length of the anchor. This will ensure that the even if there is a little bit of debris left in the bottom of the hole after drilling, the anchor won't bottom out to early leaving it proud of the surface of the timber. 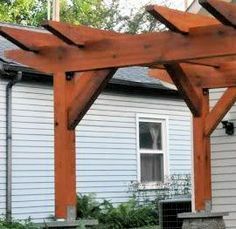 For high decks, beams must be notched into both sides of the 6X6 support post. 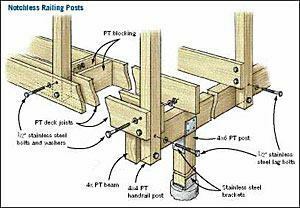 *For tall decks , 6x6 posts are substituted for the 4x4 posts and support beams are notched into the faces of the 6x6 posts. 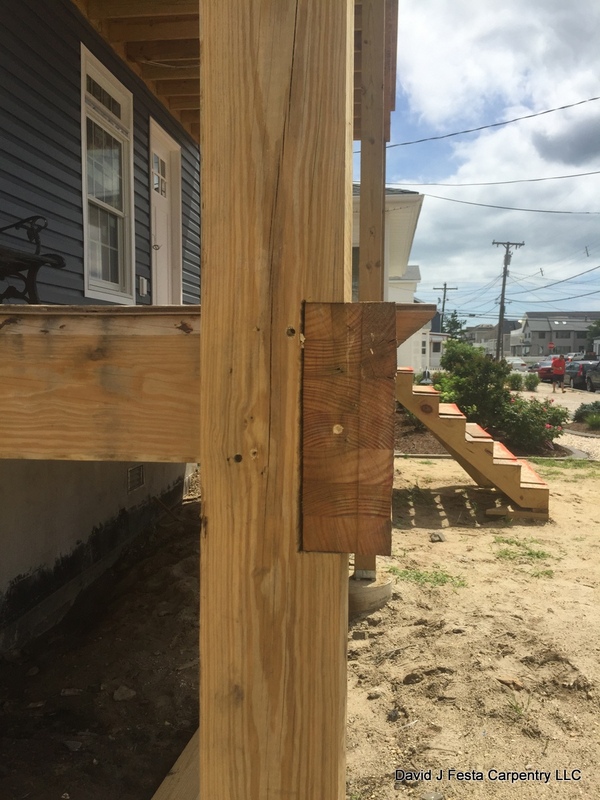 I would set a larger post (maybe a 6x6 or a metal post) as close to the house as your foundation allows, even setting it deeper than normal for extra strength. Get long rails/stringers so that it can run past the post and to your house. Cut the rails at least 1/2" short of the house. Attached your panels as normal.